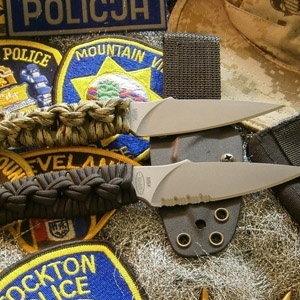 The MBK was designed with a 4" spear point blade as a more aggressive boot or neck knife for the Special Operations, SWAT, and tactical communities. The MBK is a light and slim utility knife that is easily concealed for offensive, defensive and cutting chores. A Kydex sheath is included for attachment to the forearm, neck or sliding into a boot. The MBK is made with our special blend of titanium, which has very superior wear resistance and is thru-hardened to Rockwell C 47, while still maintaining its flexibility. This knife will never rust and is non-magnetic. The MBK is available in approximate 8" length, partially serrated or plain, with a skeletonized handle. We also have limited edition blunt tip or tanto/spear point hybrid with partial serrations available until stock runs out. Optional handles include G10 composite material with titanium screws or braided 550 cord wrap in your choice of color (ACU, Black, Blue&Red, Blue, Black&White, Desert Sand, Desert Tan, Bright Green, Multi Camo, Olive, Orange, Red, Red&White, Tan, Woodland Camo, Yellow&Black, or Yellow).